ST. LOUIS, MO. 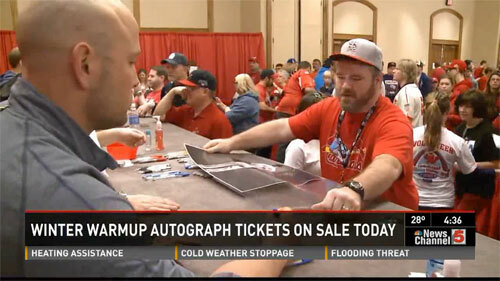 — The St Louis Cardinals will be signing autographs at their annual Winter Warm-Up which takes takes place on Jan. 17, 18, and 19 at the Hyatt Regency St. Louis at the Arch Hotel. There are a limited number of autograph tickets available for each player. Autograph tickets went on sale Tuesday morning. Source: KSDK-TV. Fans line up on Jan 6, 2015 to purchase tickets for the annual St Louis Cardinals Winter Warm-Up. In order to obtain a player autograph requires both a ticket for Winter Warm-Up ($40 for fans 16 and over; $15 for kids 5 to 15) and the specific player autograph ticket. Proceeds from each specific player autograph ticket goes to Cardinals Care. There are a limited number of autograph tickets available for each player. Other current and former players will be signing free autographs. For for more information about purchasing tickets and a list of dates and times the players will be signing, visit the Cardinals’ website. Click here. Sports Speakers 360 is a booking agent for pro athletes. If you would like to book the St. Louis Cardinals players for a speaking engagement or personal appearance, contact our booking agent for fees at 1.855.303.5450.